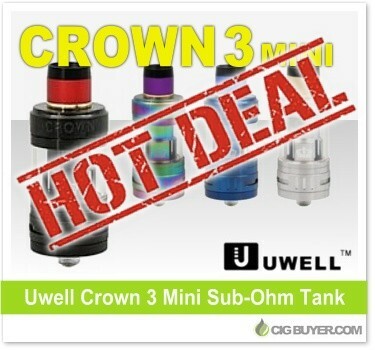 Uwell Crown 3 Mini Tank Deal – ONLY $9.99!!! Volcano Cigs has a bunch of outstanding blowout deals right now, this is just one of many that caught our attention. While supplies last, get the Uwell Crown 3 Mini Tank for only $9.99! At 22.6mm in diameter, the Uwell Crown 3 Mini Sub-Ohm Tank retains all of the same great features as it’s high-performance big brother, but holds 2ml (or 4ml) of e-liquid with a threaded top-fill design, plug-and-pull coil system, 4ml replacement glass and triple bottom adjustable airflow. It’s compatible with standard Crown 3 Tank heads and comes with 0.25 (80 to 90W) and 0.4 (55 to 65W) SUS316 parallel coils.